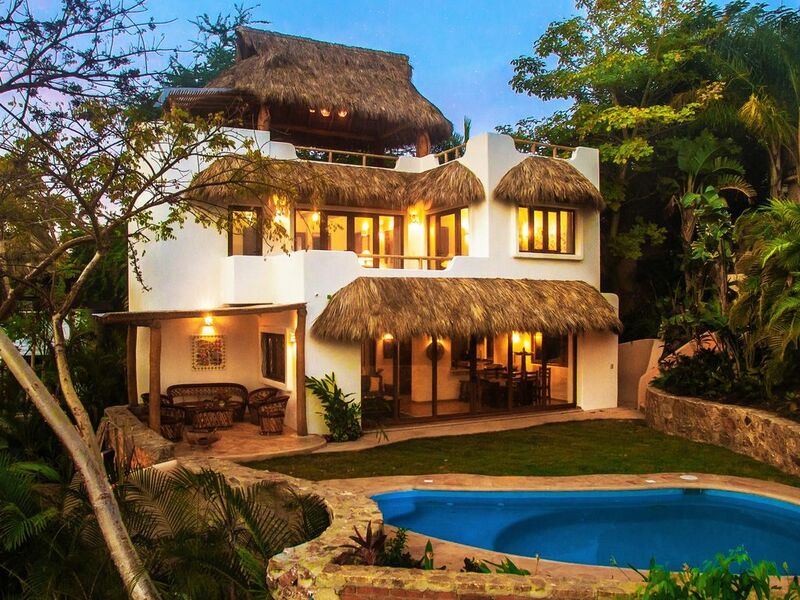 Casa Carino is a part of the luxury vacation rental complex called "Dreamer Circle" in the Pacific Heights Area of Sayulita, the most sought after location in town. Designed by Sayulita's most famous architect, Miguel Valverde, who built and designed Casa Paloma, Casa Sonadora and Villa Colina - all next to Casa Carino. (He also designed and built a house for the President of Mexico!) Casa Carino is a truly special luxury home for the discriminating vacationer in Sayulita's best neighborhood and the closest to the beach and town plaza. A total and complete remodel was just completed. The original house was gutted and additional stories are being added. Please viewVRBO Listing #5885 or VRBO Listing #440595 to see the quality of homes that this owner and architect have built! 2 bedroom suites plus another convertible TV/Bedroom with adjoining bathroom. There is 1 king bed, 1 queen bed and convertible luxury king couch bed. There are 2 outdoor showers. This wonderful property has amazing ocean views, a heated pool, tropical landscaping and yet only two blocks from Sayulita's town center and main beach. The house is surrounded by beautiful gardens which provide uncommon beauty and serenity. The views of the hills, and village are exquisite. The home is furnished with incredible art and furnishings and every single detail of this home is thoroughly considered to grant you a very pleasing aesthetic. Casa Carino is the 4th Sayulita house created by the owners and this is their favorite - the place that they stay when they come to Sayulita. At Casa Carino, you can enjoy the essence of Sayulita, Mexico. The atmosphere here is that of a small, friendly, fishing village in an exotic natural setting. The perfect, peaceful setting to relax and enjoy Sayulita's unique beauty. PLEASE VIEW THE FLOOR PLANS IN THE PHOTOS SECTION. My wife, Joan, and I, Dennis, live most of the time in an area frequently referred to as the northern tip of the wine country in California, just above Napa Valley. I sold my Internet Marketing Company, my wife wound down her successful art business and we started buying property in beautiful Sayulita. We are semi-retired now, but still manage to keep busy with all our real estate projects, investments and family. We travel quite a bit together and with our two married daughters and their husbands and their growing families. One of our daughters is a successful Interior Architect in Los Angles who is married to an entrepreneur who is the majority owner and CEO of a major software company. The other daughter is an occupational therapist, whose husband is a Director of Photography for numerous TV shows. We are an active group. We all love to ski, hike, scuba dive, surf, bike, boat, ride motorcycles, and hang out together in beautiful environments. We are grandparents now with both daughters and are thoroughly enjoying this delightful new addition to our lives. This property is right next door to two of our other properties - Casa Sonadora and Villa Colina and is a perfect compliment to both of those. It has great ocean views, is just steps from the beach and town center and has a great tropical feeling. The location of Casa Carino is super convenient. I love being close to town, the beach and everything that is going on..........You can walk everywhere. A car is definitely not needed. The house is very comfortable with adequate indoor and outdoor living space, great views and a nice heated pool. 100% cotton sheets; high thread count.